The World Health Organization states that depression is the leading cause of disability worldwide, and predicts that by 2030 the epidemic of depression raging across the world will be the single biggest contributor to the overall burden of disease of all health conditions. Yet this gloomy picture masks a number of paradoxes concerning the diagnosis and cultural interpretation of depression that appear to challenge the claimed prevalence rates on which it is based. 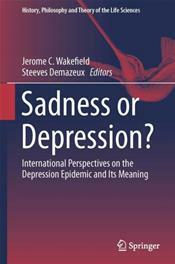 This book's essays by some of the world's leading researchers and scholars on depression explores these anomalies in detail from multidisciplinary and multicultural perspectives, and in doing so reshapes the debate on the nature of depression that is currently under way in the US and abroad. At the book's core is the exploration from the multiple perspectives of a key dilemma: is the epidemic of depression real or is it just apparent? In particular, could it be the result of criteria laid down in the official American classification system of mental disorders, the DSM, interacting with cultural changes to reshape our view of melancholy, pathologizing what were formerly normal symptoms of grief or intense sadness? The debate over the DSM's conception of depression has an international relevance, with the WHO's upcoming revisions to its International Classification of Diseases requiring coordination with the DSM. This collection of perspectives has an unprecedented international dimension, as scholars from Europe and around the world join US academics to explore a central and controversial element of contemporary psychiatric diagnosis - and one that has enormous practical implications for the future of mental health care and how we view our emotions. The book's accessible essays will make it useful to scholars, practitioners, and students across a wide range of disciplines.